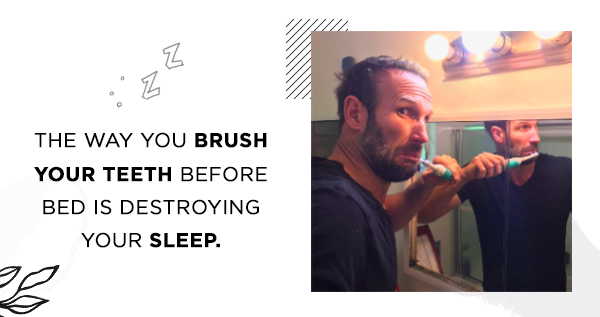 The Way You Brush Your Teeth Is Destroying Your Sleep. So, the way you brush your teeth could potentially be destroying your sleep. Yep, you heard that right. Most people feel that way when they first find out the way they’ve been brushing their teeth is causing sleep problems. Are you eager to find out the “why” and “how” right now? If you want to bypass the medical and scientific background that explains it in detail, and you want to skip right to the answer, click here. If you’d like to drag the suspense out a little more, kinda like a Game of Thrones storyline where you’re desperate to know how the story ends but you know the fun will be over once it does, then keep reading a little more. Scientists have increasingly been warning us of the dangers of nighttime exposure to artificial light. 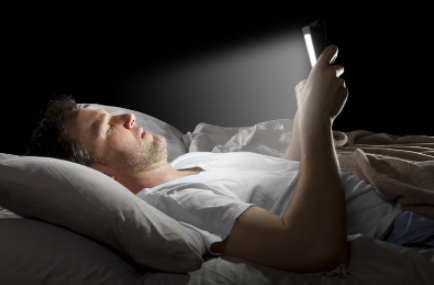 An overwhelming body of new research has found that the harsh blue light emitted by high energy digital devices such as smartphones, tablets, laptops, TVs and household light bulbs plays havoc with your sleep and overall health. Experts say that nighttime activities such as checking social media, watching TV, and taking selfies are increasingly linked to obesity. This is due to the exposure to harmful blue light from high-energy devices that prevents your body from naturally creating melatonin, the hormone that helps us sleep. Scientists suggest that artificial light, particularly blue light, deceives the brain into thinking it’s still daytime. Therefore the brain doesn’t create melatonin and the result is poor sleep. A poll by the National Sleep Foundation stipulated that 95% of 1,508 respondents (13–64 years old) used electronic media within the hour before going to bed. The electronically-produced blue light is causing serious strain to your eyes, my friend. Every time you check your email, watch TV, use social media, play video games, and take photos, you risk experiencing digital eye strain and poor sleep. Are experiencing blurred vision, headaches, with neck and shoulder pain? You should read this article explaining digital eye strain. Is Your Health A Ticking Time Bomb? I know it may sound crazy but the world’s top doctors warn that too much of this brain-damaging blue light can cause eye fatigue, headaches, poor sleep, diabetes, obesity – even cancer. The effects of blue light can increase your risk of cancer. “Chronic exposure to artificial light at the wrong time of the evening is dangerous to your health,” says clinical psychologist and sleep expert Dr. Michael J. Breus. Harvard University’s Dr. Anne-Marie Chang’s 2014 study found that people who used electronics before bed took longer to fall asleep, had less deep sleep, it took them longer to wake up the following morning and they reported feeling sleepier and lethargic when they finally did wake up. “This can have adverse impacts on performance, health, and safety,” she said. Dr. Breus and Chang are only two of a growing number of scientists and sleep experts sounding the alarm. The news is even worse for the weight conscious, with research finding a direct link between poor sleep and obesity. “The recent obesity epidemic has been accompanied by a parallel growth in chronic sleep deprivation,” said Dr. Sanjay Patel, Assistant Professor of Sleep Medicine at Case Western Reserve University. Australian Sleep Specialist Dr. Richard Simon, MD, agrees. And, here’s the worst part, we may have unknowingly been threatening the health of our children because kids who use electronics haven’t yet developed natural protection in their eyes. Dr. Dave Lee, from the Children’s Eye Center, says by the age of 17, children would have spent six years looking at digital devices. Dr. Lee told Fox News: “As we get older, the lens in our eyes naturally gets a little bit more yellow. That acts as a natural filter for that blue light. Major electronics brands, Apple and Samsung, seemingly know how dangerous their products are for us. Apple now has a “Night Shift” feature on its iPhones, which reduces the phone’s blue light exposure at nighttime. Android has the “Twilight” version, which does the same. 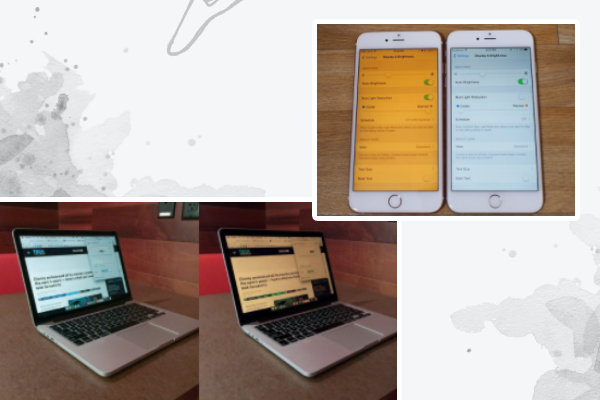 And the “f.lux” software can reduce the blue light exposure on your laptop by adjusting the display’s color temperature to an amber tint when the sun sets. These tactics are great at reducing your blue light exposure. However, none of these apps or settings help you block the artificial blue light emitted from your TV screen and light bulbs. How effective is the Apple Night Shift app. How effective are these blue light blocking apps? You may think switching off electronics in the last hour before sleep will eliminate the problem. However, if you are still sitting in your living room with the lights on or reading with a bedside lamp, you’re still being exposed to the blue light and your sleep will be affected. If you’re still brushing your teeth in the bathroom before bed, you’re still exposed to the bathroom light! Brushing your teeth at night in a bathroom that emits artificial blue light is stimulating your pituitary and pineal glands, and disrupting your body’s melatonin production. Thus, making it harder for you to fall asleep. It means you’re more likely to toss and turn in the night, and you’re more likely to spend less time in that deep, REM, restorative sleep essential for optimal health. Therefore, you can still feel tired even after getting 7 or 8 hours of sleep. To sum up, the way you brush your teeth at night is effectively destroying your sleep and it’s time to find a solution, my friend. The question is, how can you return to brushing your teeth at night knowing that you can sleep the way nature intended for you to sleep? What’s the perfect nighttime routine you might wonder? Well, the perfect scenario is to switch off all electronics, switch off all the lights in the house, and sit in the dark. 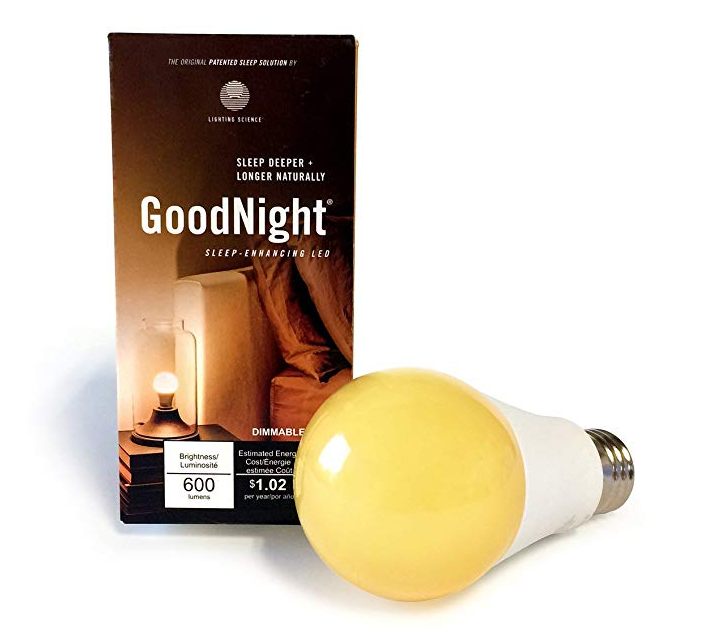 Sitting in the dark once the sun goes down is faithfully the best option for ensuring you get a great night’s sleep. Despite that, are you really going to do that? Let’s face it. We love our light at night, we love to watch our favorite shows, and we love to update social media. With that being said, what’s the next best thing we can do? Wearing orange-tinted blue-light blocking glasses filters out the specific blue wavelengths of light shown to cause poor sleep. Friends, I’ve gathered some resources to help you repair your sleep. 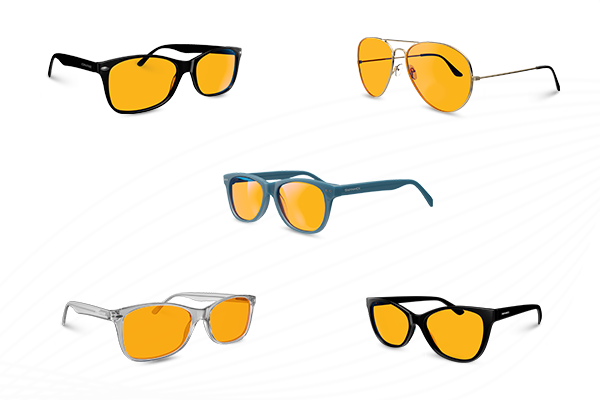 A Swiss study of 13 teenage boys, published in The Journal of Adolescent Health, showed that when the boys donned orange-tinted glasses in the evening for a week, they felt “significantly more sleepy” than when they were wearing clear glasses. Due to kids being in most danger from the blue light, it’s important that kids wear blue light blocking glasses specifically designed for children. Separate, independent studies at the University of Toledo in Ohio, the University of Lavel in Quebec City, and the Corvalles Psychiatric Clinic in Oregon, among others, have backed up the findings. The research conducted at the Corvallis Psychiatric Clinic in Oregon suggests wearing blue-light blocking glasses are an effective and inexpensive treatment for insomnia and sleep deprivation. “Anything that will decrease that blue light exposure at night will be helpful,” said Christopher Colwell, a neuroscientist at the University of California, Los Angeles. Ultimately, Dr. Breus said we all needed to seriously rethink our understanding of light and its effect on human health. “We live in a culture where electricity and artificial light are everywhere: inexpensive and always available in, seemingly endless supply. “So it’s absolutely necessary that we stay educated and aware of all of light’s possible effects on our brains and our bodies. 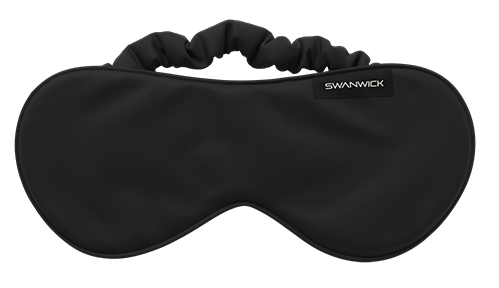 The National Sleep Foundation advises: Your body clock is affected by light, so turn off bright overhead lights and consider wearing a comfortable sleeping mask. Download Nightshift (iPhone) or Twilight (Android) to reduce blue light on your phone. Doc Parsley’s Sleep Remedy to help you achieve the best sleep possible. If you’ve made it this far, then I’m super proud of you for prioritizing your health. I know you are determined to make the necessary changes in your life that can effectively improve your overall health. The first step is to Grab Your Swannies today!